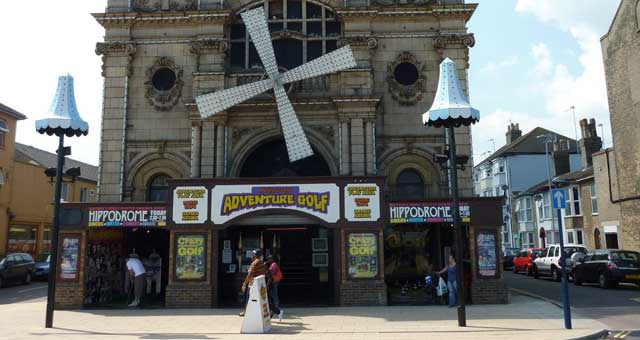 Hollywood Indoor Adventure Golf01493 844172work Pitch & Putt/Crazy GolfHollywood Adventure Golf, Great Yarmouth, is a huge unique 12 hole indoor crazy golf experience housed in the historic Windmill Theatre building. 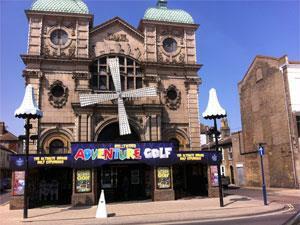 Hollywood Adventure Golf, Great Yarmouth, is a huge unique 12 hole indoor crazy golf experience housed in the historic Windmill Theatre building. Fun for all the family, whatever the weather! With incredible themed settings and a fascinating collection of cinema and theatre memorabilia in Britain's first indoor adventure golf. On arrival in Great Yarmouth follow signs for the Seafront, taking a right turn at the mini roundabout onto Marine Parade. Hollywood Adventure Golf is located at the far end of Marine Parade, with plenty of parking nearby.